White Castle or McD's? Choose your heartattack! Upon arriving at work today, I was suprised to see a monument errected in our break room. 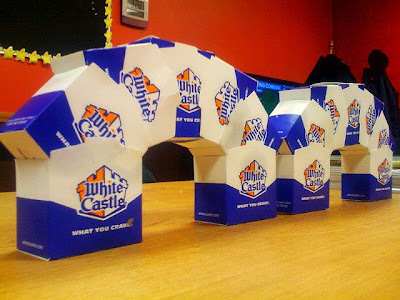 Apparently an employee decided to devour his own weight in White Castle burgers over the weekend and brought a small number of the leftover boxes to work and decided to play around with his creative side. I asked him where he got all of the boxes, he then told me how he drove 4 hours to the closest location... must have been a Harold/Kumar type of urge, but I didn't ask. 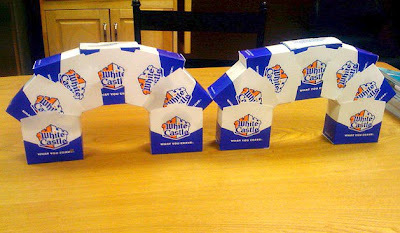 Having never seen/been to White Castle (I have no idea where the closest one even is) I do not know if White Castle also has arches prominately displayed in their locations, but I know that these arches look more like a tribute to McD's! These were the only boxes to be displayed there were EASILY 15 more in trash cans all around the building. I unfortunately left my Nikon at home, so I had to take these with my iPhone and brighten/sharpen them a little in PS. Hungry? Newer PostHanging out with Chris, Brittney, Ian and little Joshua. Older PostWhat's, plastic, 8 feet tall and communicates with whistles and beeps?